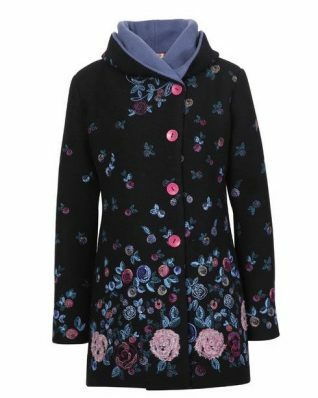 IVKO Boiled Wool Jacket with Embroidery – exquisite black merino wool coat featuring a floral embroidery throughout, contrast colour lining, a hood and side pockets! Comfortable flattering fit. 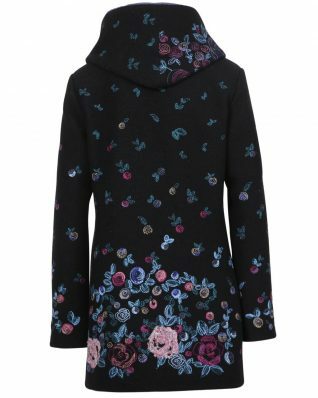 High quality medium weight fabric, very warm. Made in Serbia. Glamorous style, wow! Fitting Tip: this style fits more generous. Purchase a size down, if you prefer a tighter fit. With Lining. 100% Merino Extrafine Wool. Length: 80.5 cm (size 38). Style # 82504. 82504_019. Coats Jackets.